BuddyGolf is an addictive golf prediction game, played every week and based on PGA Tour events. In our latest version, you are able to play in a free and/or fee-based weekly game, competing against players for weekly prizes as well as an Order of Merit. 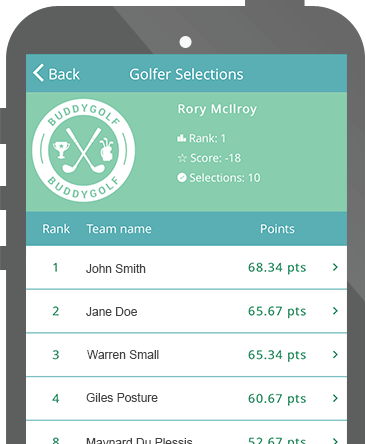 The Buddygolf App is available for download on both the App Store and the Google Play Store. Wait for your weekly (generally on a Tuesday) notification confirming that the tournament is ready for your selections. Select your 12 players before selections close (generally a few minutes before the start of the tournament). Enjoy the golf more and become addicted like the rest of us. You select 12 players from the field. You can change these selections up until the tournament starts, whereafter no changes are possible. Positive or negative points are allocated to each golfer based on their finishing positions at the end of the tournament but your relative position will be visible throughout the tournament. Players ranked 51+ in the world will receive double points for all above point allocations so that you have an incentive to also pick players outside the top 50 in the world and think more carefully about your selections. If there are ties for positions 2-9, we will add up the points for all those positions and allocate them evenly to each player. Any players outside the top 50 in the world will then be allocated double those points. For example, if three golfers finish tied for second place, the calculation will be as follows (15+13+10)/3 = 12.67 points. If one of these three players is outside the top 50 in the world, this result will be doubled, therefore this player will receive 12.67*2 = 25.33 points. If you have selected a player who withdraws before the tournament begins, you will receive 0 points for his selection. If a player you have selected is disqualified or withdraws after the start of the tournament but before the start of round 3, you will receive the same negative points as he would have received had he missed the cut. If a player you have selected makes the cut and withdraws or is disqualified he will receive 0 points. If you would like to test your skills over a longer period of time, consider joining the Order of Merit which will accumulate your points over a range of tournaments. There are 2 Order of Merits for 2019. Your points per tournament will be accumulated and displayed in the Order of Merit tab on the app. Please take note that each of the four majors receive double points for the Order of Merit. 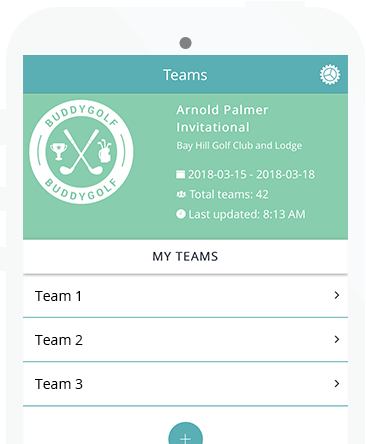 Download the Buddygolf app now! We look forward to you getting addicted to playing Buddygolf.